A couple of years ago I went on a bit of a rampage about bottled water (click “Water” in Categories to see a list). I knew it was more than a little ridiculous to pay for something you could get for free out of the tap, but the more I learned the more than ridiculous I realized whole affair has become. The knowledge I gained from that research has made me appreciate the quality of water coming out of my tap, closely watch water-related issues in the local political scene, and make the effort to ensure I carry my own water with me whenever possible. This week Vreni at Wellness Tips has written a thorough article, reposted below, that covers the environmental impacts of the plastic bottles associated with bottled water and a multitude of other convenience drinks. I highly recommend you read it and also that you watch at least one of the documentaries available on the subject, as its an issue with severe local repercussions and significant global impacts. Did you know that the oil it takes to make, ship and refrigerate that bottle of water, would fill that bottle a quarter of the way? When one considers that the water standards set by the Environmental Protection Agency for tap water are higher than the water standards set by the FDA for bottled water, and one realizes that it costs 10,000 times more to produce a bottle of water ($2.50 a liter or $10 a gallon – much more expensive than gasoline) than to simply turn on the tap, we must ask ourselveswhy we are wasting our resources and our money on bottled water. I think originally bottled water became popular because it was perceived to be healthier than tap water, but is that really true? About 40% of the bottled waters on the market ARE tap water (including Dasani and Aquafina) with some minerals taken out, or added in – whatever the manufacturer believes will sell. Some waters, like Evian or Fuji are spring waters, higher in minerals and therefore healthier than some of the softer municipal water supplies, but is the environmental cost worth the price considering how easy it is to add back minerals into filtered tap water? The PET plastic that the water is sold in is made from crude oil. In 2004, the amount of oil needed to satisfy the demands of Americans for bottled water was in the neighbourhood of 17 million barrels, enough to fuel over a million cars for a year. Then add to that the oil that is needed to ship the water bottles to market. Apparently nearly a quarter of the bottles of water are shipped cross international boundaries to reach store shelves – that is a lot of oil used in transportation. Making plastic bottles also wastes crazy amounts of water. 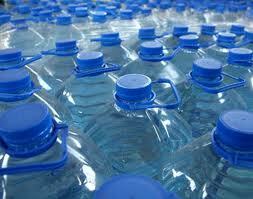 It takes 6.74 times the amount of water contained within the bottle to make it, which is a staggering amount of water. Water is becoming more and more scarce worldwide, so why are we wasting it making bottles? And finally, plastic bottles need to be disposed of, and only 1 in 6 bottles is recycled, while all others are littered on land or in waterways, or find their way to landfill sites. It takes over 1000 years to biodegrade plastic, so the result is mountains and mountains of completely unnecessary garbage; furthermore, I’m not sure I want that plastic leaching into water tables etc. Tap water is very economical, arriving at our taps through energy-efficient infrastructure, and due to the high water standards required by government bodies, is usually quite safe. One can easily buy a Tap Faucet Water Filter System to filter out chlorine or other contaminants one may be concerned about.Filters that filter out fluoride may be more challenging to obtain, but they are certainly available. So rather than buying bottled water, get a good re-usable stainless steel water bottle, filter your tap water, and take your water with you. There are even re-usable water bottles that come with a filter in them, so if you need to refill while out, anyone’s tap water will do. If you live in the States and want to check where your municipal water comes from, find out what’s in it so you know what if anything you need to filter out,click here. For Canada or elsewhere, try googling your home town and “water quality” and see what comes up. I got this link for Vancouver, for example.